Purchasing a property for most people is the biggest single transaction that will happen during their life. Being sure that the property they are buying is an asset or liability has been the biggest worry for purchasers. As from the 1 April 2011 the City of Cape Town requires that every property transaction is accompanied by a Plumbing Certificate of Compliance which is to be issued by a registered plumber. 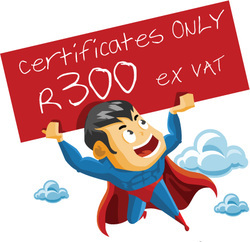 The reason for such a certificate will give the purchaser piece of mind knowing that their plumbing systems are functional and meet all requirements set out by SANS (South African National Standards), as well as bring possible defects and/ issues to the owner/ buyer's knowledge. Roughly 70% of geysers in Cape Town are non compliant, which could possibly cause untold damage to ones prized possessions in the case of failure. The SANS standards are there for a reason, to keep the consumer safe, and limit the amount of damage which could be caused if it were not to standard. As home owners find more ways to add value to their homes at the cheapest rates, we are coming across many installations which have not been carried out by Qualified Plumbers correctly or not done according to the standards set out by SANS. If the quotation submitted looks or sounds too good to be true, it more than likely is. Insist that a Certificate of Compliance is issued before any dealings are finalised. This will bring any issues to your attention. The Certificate is only to the buyers advantage, having this done could bring serious issues to your attention which went unnoticed, not visible or added since the property was last viewed. Requesting that your plumber inspects the property would be a good idea as well to ensure that nothing was missed and comes from a source you can trust would definitely be to your advantage. Finding a loyal maintenance plumber is hard to come by. If you find a plumber who is prompt, presentable and reliable continue to use them, as they will familiarise themselves with your plumbing, and make life easier for you when future problems occur. Mention the plumber to the new owner as it will more than likely need a plumber sometime or another, having one who is familiar with the system will assist in having the work completed in maximum efficiently. It is difficult for new plumbers to make an accurate assessment of on going problems on their first visit, building a good relationship with your plumber, for us is the most important point and has helped us grow to where we are today. To request a Certificate of Compliance.